You would think that a garden around an elegant palace would be for eyes only, photos permitted, but, by golly, you better stay off the grass. 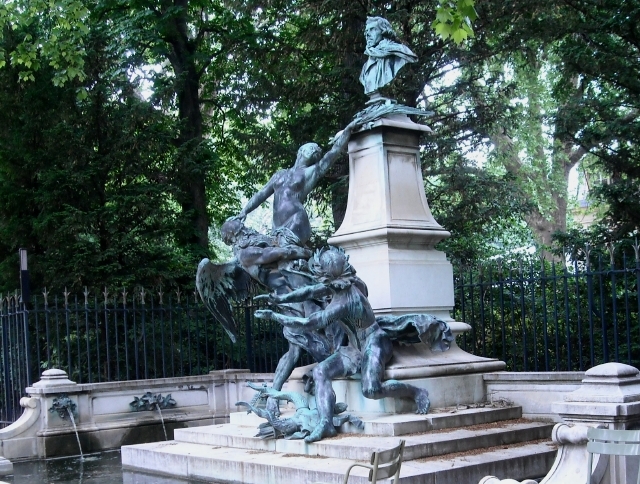 Luxembourg Garden surprised us, and maybe that’s why Parisians love it so. It’s the most inviting, informal formal garden we’ve ever been to, an island of tranquillity resting comfortably in a busy city. Yes, there are formal plantings (we’ll talk more about these later), but in warm weather this is a playground. Play stations and puppet shows, and model boating on the basin below the palace. 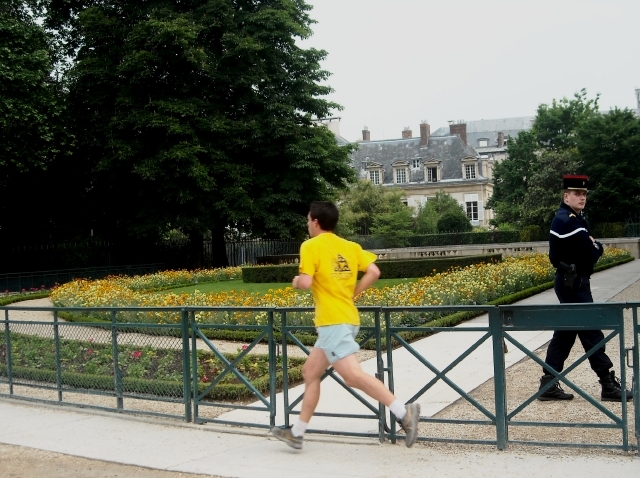 Chess, joue de boules, tennis, and paths for strolling. Flower beds, allees and copses for gardeners and romantics. 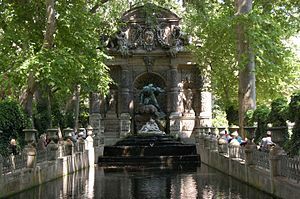 Statues and fountains steeped in history (if you are a fan of French queens and French women), mythology and the arts. Something else we’ve never seen in a public garden: handsome lightweight aluminum chairs, lots of them, everywhere, that anyone can cart anywhere. People can meet, eat, chat, or read a book wherever they feel comfortable. This is a garden for people, though we must say, chairs scattered higgledy-piggeldy around the grounds does tend to take away from historied garden design. We doubt there were any but benches when little Cosette and her benefactor Jean Valjean came to the Luxembourg Gardens to sit and enjoy the sun, giving rise to an unexpected glimmer of romance between two hearts, but you have to read Victor Hugo’s Les Miserables to learn the rest of the story. And we doubt that Marie de Medici, a member of the wheeler-dealer Medici family in Florence, would have approved of portable aluminum chairs in her gardens, but then it was only hers for a very short time. Soon after her husband, King Henry IV was murdered in 1610, she initiated construction of palace and garden, inspired by memories of growing up in Pitti Palace and romping in the Boboli Gardens in her hometown. Aside: We remember well an afternoon spent dashing around the hills of the Boboli, hunting for its fabulous Grotto, stumbling onto it only after giving up and following the Exit sign. Though we might not have taken the time to appreciate the finer points of the Boboli’s design, we could understand how Marie might have enjoyed dallying there when she was young and didn’t have to go hunting for a grotto. 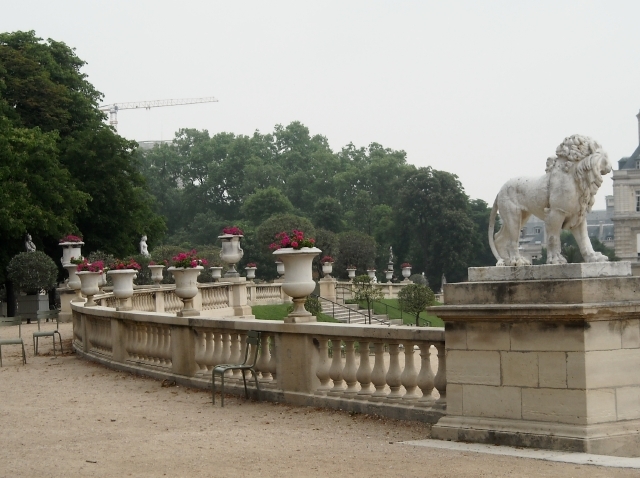 Did we recognize the Boboli in these gardens? Only after some reflection. Back to Marie, whose turbulent life, incidentally, would be grist for a juicy historical novel. Given the circumstances, you can’t blame her for wanting to bring Florence with her. 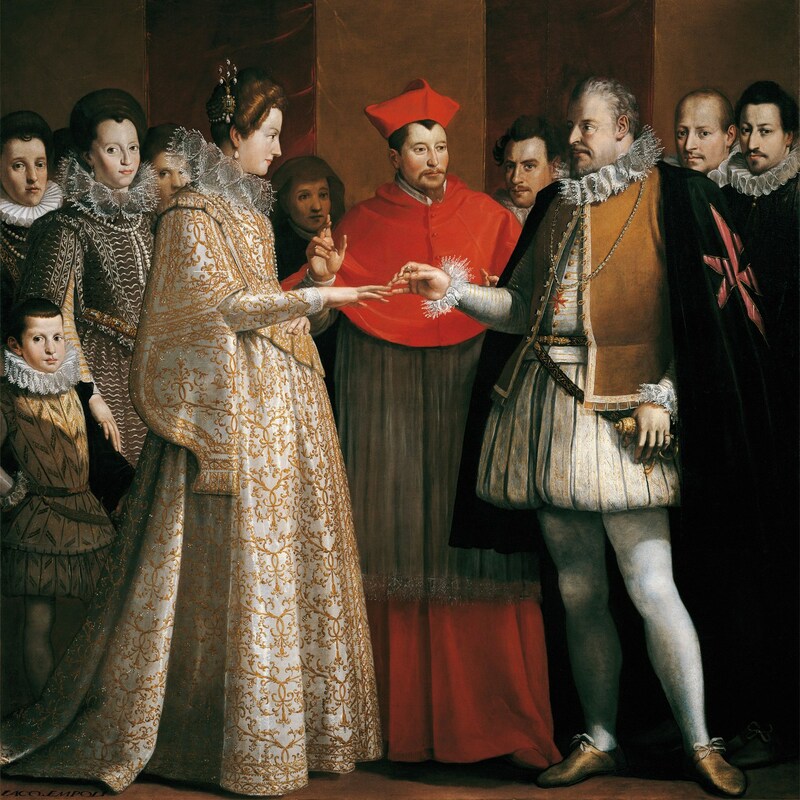 King Henry, who was well known for his dalliances, did not bother to attend his wedding to her, so he sent a proxy to Florence. What he truly wanted was Marie’s dowry to pay down debts, no glimmer of romance there. As regent to her young son, she had the world stage to dabble in, until he got so angry with her meddling, he banished her when he became king. Even after wheedling her way back into his good graces, she was so troublesome, Cardinal Richelieu himself, once an ally, dismissed her permanently. She died in Cologne, supposedly in penury. 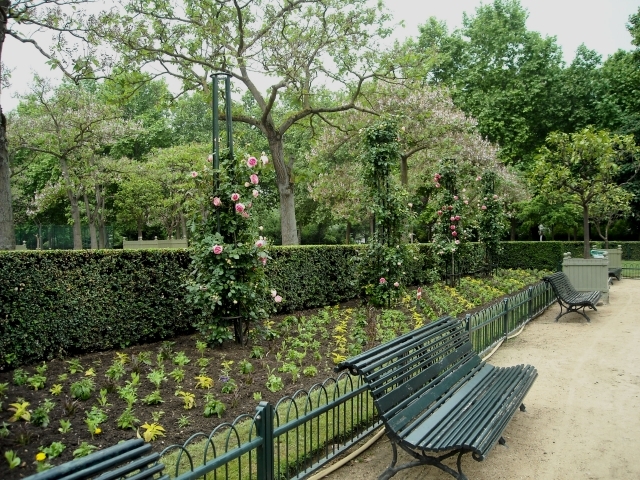 During her brief tenure in Paris, Marie hired landscape designers to plan her gardens. Included were a Medici fountain and grotto reminiscent of home — and 2000 elm trees. Since then, the gardens have teetered between benign neglect and renewed interest. 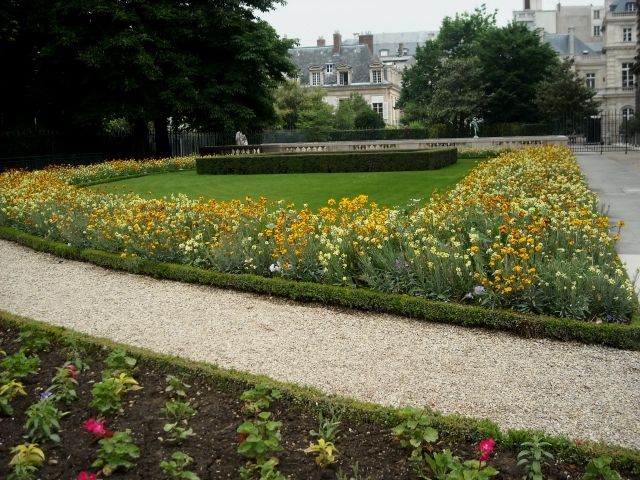 French revolutionaries converted the palace into a prison but added acreage to the gardens by confiscating the land of a neighboring monastery. Formal beds, fountains and statuary were added now and again over the centuries — including the original, scaled-down model of the Statue of Liberty. Even the Luftwaffe took a turn in the palace. 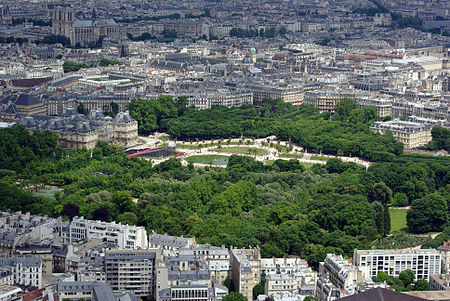 It became headquarters for their operations while they occupied France in World War II. 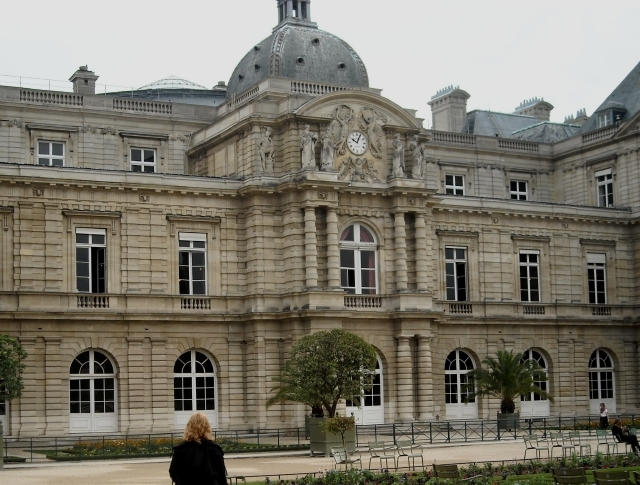 Today the palace is the seat of the French Senate. 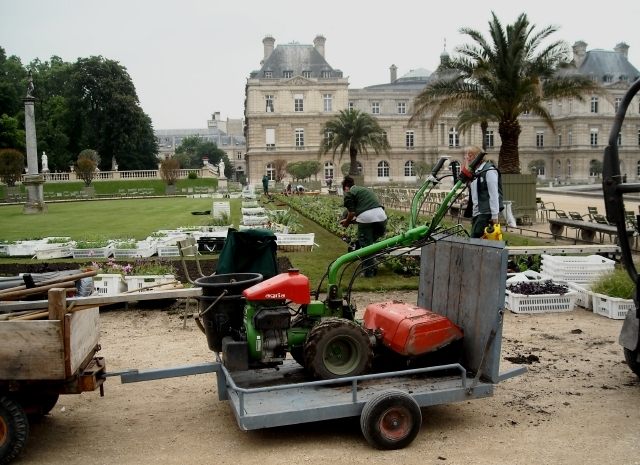 Getting back to the subject of formal plantings, it’s not often that you can sit and watch what goes into planting a new crop of annuals in a public garden. 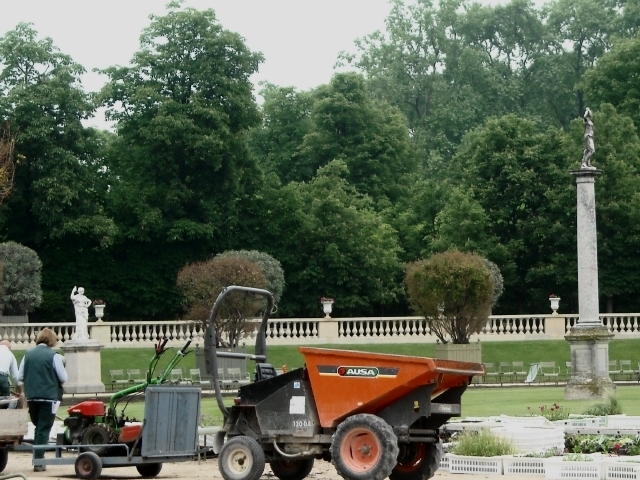 Rototiller and dump truck among statues and obelisk. 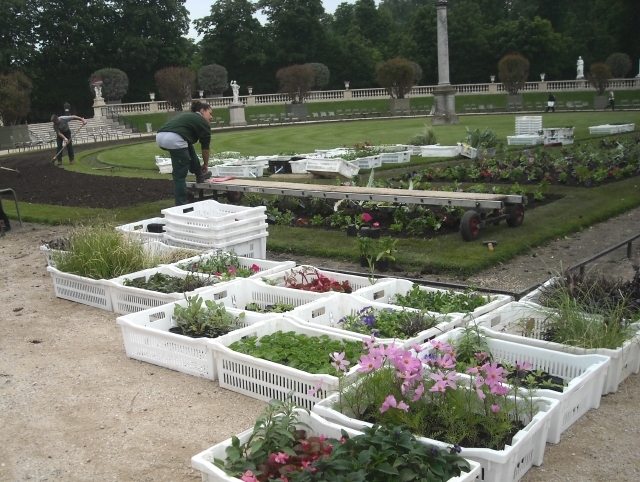 May weather is cool here, so soil is still being prepared as flats of plants wait to be set out in beds. This is a massive planting operation. After being meticulously spaced and placed, the youngsters will be finger-dibbled into soil made friable by the rototiller. Soil that is never compressed by human feet. 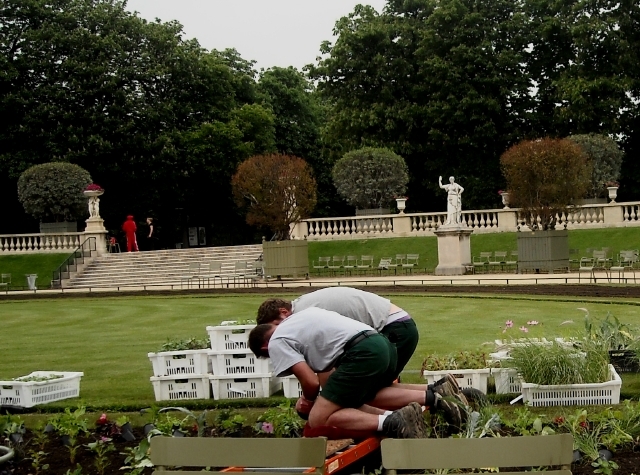 Kneeling, hunched over, and propelling themselves on a narrow rolling platform, gardeners plant the length of the bed, row after row in a matter of several minutes. Wish we could transplant some of their efficiency into our own gardens. On second thought, maybe this is a bit too efficient for us. Not exactly a stroll down a garden path. Pass the liniment, please, and…. 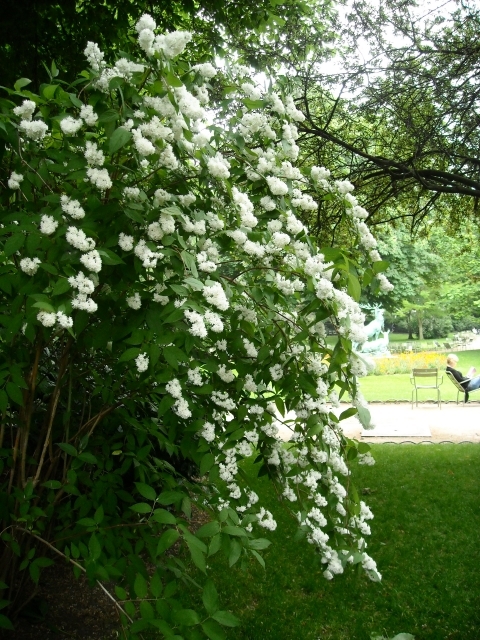 …let’s take a less athletic turn around those islands of shrubs, where old-timey favorites (to us) were in bloom. Pictured above is a drift of weigela. 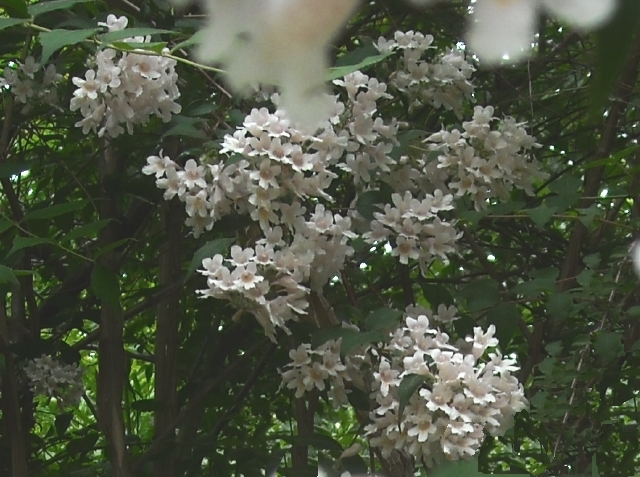 . .
. . .and an equally pretty fountain of deutzia. We grow both of these in our gardens at home. 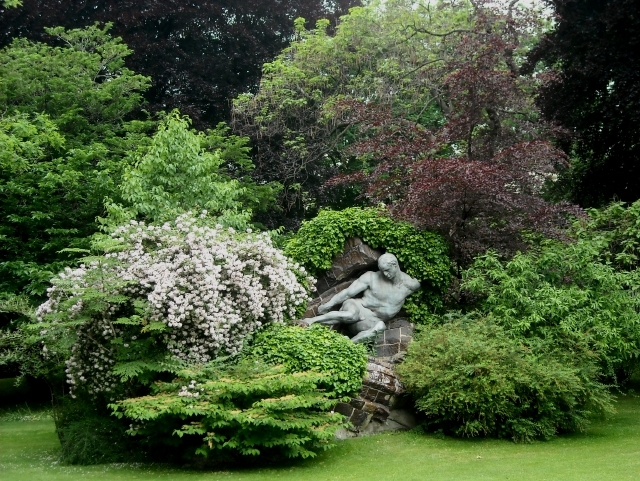 Hidden among the shrubs is an akimbo statue of Hercules at one of his twelve impossible labors: changing the course of the River Alpheus so he could clean those Augean Stables in one day. Imagine streams of water where shrubs are today. Some day, when the sun is shining and the garden is in full summer swing, we’d like to return to watch kids racing boats, maybe bask with tourists and locals, and admire those starter plants grown up. In the meantime, here are some pictures from Wikipedia of the gardens in sunnier seasons. A challenge: how many aluminum chairs can you find in these pictures?